Home / Blog / WHERE DO YOU GET YOUR IDEAS? I’m sure all writers will recognize this as the question readers ask more often than any other. I wonder if other writers find it as nearly impossible to answer as I do. Most of the time I really don’t know where my ideas come from. I often look back on a finished book, or even one in progress, and wonder how on earth I came up with a particular plot idea. Perhaps that is partly because I really can’t plan a story ahead of time. I usually start with two characters (and I don’t even know them particularly well at the start!) and a situation. But I have no story apart from a few vague notions of where it may be headed and the certain knowledge that it will end happily. The story takes shape gradually after I have got the characters into that situation, acting and reacting and interacting, though even then there are many false starts and restarts. Often I have to go back and rewrite as new ideas pop out of the ether. It is not a comfortable way to write. Nor is it for the faint of heart. But it is challenging and exhilarating and I wouldn’t want it any other way. Somehow everything always seems to work out for me. After more than a hundred novels and novellas that is reassuring—especially when I am deep in despair after having painted my characters into a corner with no discernible way out. I do know, however, what sort of thing might inspire me to write—and it is almost always something that stirs some deep emotion in me and inspires me to write a story from that emotional place. It doesn’t have to be a romantic emotion. It can be a scene of extraordinary beauty—the mountains and lakes of British Columbia, a sunset reflected across the ocean, or a picture of giant trees in a rain forest. It can be a work of art. I remember once sitting and staring at a picture of Michelangelo’s Pieta for well over an hour. Or it can be a piece of music. Beethoven’s Violin Concerto can do it to me every time. So can Louis Armstrong’s What a Wonderful World or Bette Midler’s The Rose. And definitely it can happen with any music sung by a Welsh male voice choir—Hiraeth(Longing) or Myfanwy, for example, or the Welsh national anthem, Mae Hen Wlad fy Nhadau (the land of my fathers). 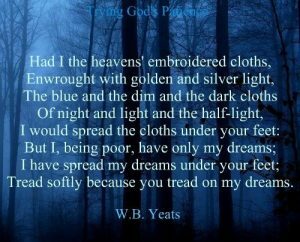 Or sometimes it is a quotation or a short poem, like William Butler Yeats’s Had I the Heavens’ Embroidered Cloths. I always want to capture these soul-deep emotions in words of my own and in a love story. Just occasionally I know exactly where a story idea comes from because I have chosen to set a book within a definite historical event. It doesn’t happen often, but I can think of three of my books that came into being that way. I wanted to set a love story in my native Wales, and chose to set it in one of the coal mining valleys of South Wales during the early years of the Industrial Revolution, when the resources and the workers of Wales were terribly exploited for the profit of wealthy mine and steelwork owners, mostly Englishmen. I had to do a great deal of research for LONGING and make sure that my story was woven about authentic events. Nevertheless, my passionate identification with the Welsh (even though my hero was one of the English owners) helped me keep the story on track as an intense love story, I believe—and hope. My use of Welsh music in the book helped with that! Then there was another Welsh book, TRULY, (I hate the title, was assigned to it when I was away from home for a few weeks and had no input). The third book based heavily upon actual historical events is BEYOND THE SUNRISE, my most action-packed book, set in Spain and Portugal during the Napoleonic Wars. My hero and heroine helped shape those events, so I had to make them accurate. And then there are the stories I can’t account for in any rational way. They come from an inner place that is virtually impossible to describe in words. I have often complained that I find it impossible to think. When I sit down to try to work something out in my head, my mind either turns blank or it wanders off on a thousand tangents—or I fall asleep. At school whenever I had a paper or essay to write I could—and did—do exhaustive research, but then I could never think through what I was going to write. If a teacher demanded a detailed outline, I always wrote it after I was done with the paper. The only way I could write that essay was to sit down with paper and pen (yes, I am that antique) and write. Then ideas I did not know I had flowed with no trouble at all. The same thing happens when I write a book. Every morning (EVERY morning) when I sit down to write, I have no idea what is going to happen. I could easily plead permanent writer’s block. I have to take a few minutes (sometimes more than a few) to focus in and then just start. My daughter, who is a trained hynoptist, tells me that what I am doing is hypnotizing myself. However it is, the act of writing enables me to by-pass the mind and put myself into some other dimension—the sub-conscious, consciousness itself, call it what you will. But it works for me. Do you wonder that when people ask me where I get my ideas I find it almost impossible to answer? To one person who leaves a comment below before the end of next Wednesday, September 19, I will send a signed copy of LONGING, the Welsh historical mentioned above. The winners of the two tote bags last week were MELISSA RENNER and MARTHA JUDITH DURICK. WRITE WHAT YOU KNOW–BUT WHAT DO YOU KNOW? I love hearing about your process, as a reader and re-reader of almost all (I think) of your novels, and as a writer. Old as I am, I am just getting started, with two books out and two in progress. Handwriting rough drafts into a notebook really helps the ideas flow…it seems like the horrible first draft is more tolerable when handwritten and then I can edit and shape when typing it for the first time. My hypnosis is reading and tinkering with what I have done last…that seems to prime the pump and get things going again…most of the time. I love Longing, and if I had to pick my favorite of yours that might have to be the one. Would love a copy of your new book. I find it fascinating to hear writers discuss their process. I just can’t imagine being a writer. I guess my brain doesn’t work like that, nor do I have the discipline. What a gift!! Thanks for sharing! It’s always interesting to see how many diverse things can form the kernal of inspiration. Thoroughly enjoyed your blog it is wonderful to have the gift of writing. I have to enjoy the reading as I am not disciplined enough to to write myself. on the shelf as it will have.fallen apart from my borrowing so often. I read it. Thank you. I very much enjoyed your learning morecabout your multiple methods. It’s particularly interesting that they’re as varied as the books you write, the stories you create and the characters you share with us. When I’m engrossed in a book, it’s critical that it “rings true” – that the storyline fits the character as I’ve come to know him or her. Nothing spoils a book faster than having my mind break that fourth wall with the thought that the charactet wouldn’t behave this way. It’s never happened with one of your books. I’m so glad it works! I appreciate how your mind works! You are my heroine! Would love a copy of Longing. This one of your books that I have not read. I have been reading your books since the Slightly series. I have absolutely fallen in love with your books i got two for Christmas and have been hooked . It is so fascinating to hear how you put everything together . What an interesting writing process! I can’t imagine how you can write that way and manage to find such depth in your fully developed characters. Kudos! I learned a lot when I read that book! That history was new to me. 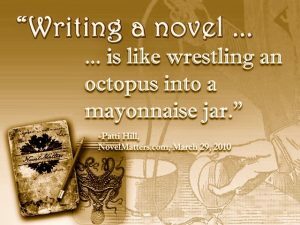 I’m always curious as to how writers get the ideas they get. I seriously think there’s magic to it! I’d love to win a copy of your book! Thanks for the chance! I enjoy reading about writers and the art of writing. I can just admire it all…it’s wonderful how you get your ideas, how you process it all. I am a translator and need to use my imagination all the time to think how can I put the words into my own language. But I cannot create something from the start. And I admire it with all my heart. By the way since I read Longing I can’t just stop thinking about the book and about Siân Jones. I love her already. Thanks for create her for us. This book sounds absolutely amazing!! I love the Bedwyn series so I’m sure I’ll love this book as well!! Whatever you’re doing, it’s working. Don’t stop! It’s so interesting to know that inspiration can come from so many different places. I’ve always wondered what influences an author, and I can definitely see many of the inspirations you mention in your books. I enjoyed reading how story ideas come to you. “..And it is almost always something that stirs a deep emotion in me …“ THAT is why we all love your writing. Your heart and soul find their way on to the pages. Thank you for sharing that with the rest of us. 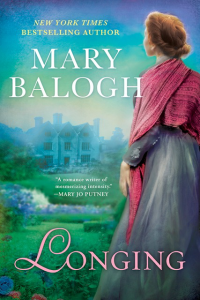 It’s the depth of the characters and the challenges they face that make Mary Balogh’s books such compelling reading. I find myself sad at the end of each novel to be parting company with the friends I have made within the pages I have just read. And then the joy when it is a series and I can reconnect with old acquaintances and see them anew through the perspective of the hero/heroine of the current story. Such is the pleasure to be found within the pages of each new book of the Survivors series for example. One of my personal favourites is the little ‘Mouse’ Sophia who grows in beauty and stature within the story told in “The Arrangement” – how happy I was to find in the opening pages of “Only Enchanting” that this story centres around Sophia’s best friend Ages. Aaah surely I will again get to meet Sophia and experience her clever wit and laugh at her characterisation of those around her. Mary you have spoiled me as I look same depth in the writings of other authors of he Historical Romance milieu. I know you write reagularly and usually have a minimal word goal, which helped me shape my writing routine (one that finally works 🙂 ). Just out of curopsity, I was wondering – did you ever mentor an aspiring author or been approached about it? Did you consider teaching writing (you were, after all a teacher)? I have done a few writing workshops over the years, Anna, always with the preface that I can describe only what works for me and may not work for anyone else on earth! I would not want to mentor–or be mentored. Creativity is too fragile and individual a thing to be interfered with. It should be nurtured in solitude. But again, that it just how I see it. It is what you do with those ideas that impresses me most. You have a gift and I thank you for countless hours of entertainment. No need to put me in the drawing. I already have this book. It is one of my favorites. Right now most of my reading is school textbooks. Every few weeks though, I take a day and read a novel. Nine times out of ten it’s one of yours. I love your writing, you sick me right into the story and I don’t want to come up until I’m done with it. I’ve had readers ask me not only how I came up with the ideas for stories, but where did I find the people? I mean how do you just invent someone out of nowhere? Where do you get the names? I totally agree with your mentoring take – to apply someone else’s logic to your process crushes your creativity. Love your books and would love a chance to read LONGING. I would never attempt to write novels, because I enjoy too much the ideas of an imaginative writer. And I don’t find writing with a (fountain) pen ancient, because you need to think about what you’re going to write because you cannot just highlight and delete it. Mmh, last time my comment didn’t appear on the list for some time, now it happens again. I wonder why? Could it be that I’m posting from overseas? The reason is that I have to approve each post before it is published, Christine. There is a lot of spam to be filtered out! I try to check every few hours for new comments. Thank you so much for this post, Mary. I have always been fascinated by creative genius; from bridge building, painting, pottery and sculpture to literary creations. I am proficient at handcrafts such as sewing, knitting, wood crafts, etc. but I always use a pattern that someone else created. You are my favorite author and I am so grateful to be able to enjoy your characters and stories that give me a much needed escape from the realities of every day life. God bless! This book sounds amazing! Your books are wonderful. My favorite is The Arrangement! That series is terrific! Thank you for the opportunity. I love to hear how authors get ideas. I have not publised a book yet- too busy teaching, but I have lots of ideas and have written books for my kids that they can read around a certain subject (force and motion) or using certain sight words. I want to write and publish when I retire, so that period looms large. I am the kind of person who finds it difficult to work under pressure as well, because I value inspiration and spontaneity. And as a teacher, I know how much planning a lesson is important, but what I like to do most is to work on the reality of the moment, from the spontaneous thing that the children brought to class, feeling the moment, responding to their demands at that moment. It’s difficult, but I believe that you can combine both things and make something beautiful and great. I’m trying to write my first book, and I’m doing a lot of research, but I only write when I feel inspired. sometimes situations are being built up in my mind at the most inopportune moment, such as when I’m taking a shower or already almost falling asleep, or even on the bus. So I let my mind work on them. When I put it on paper, it almost always comes out different, but I have enjoyed this exercise. It’s funny, but I think I can sense when a book was written with this fluency and spontaneity of the moment, or under pressure from the publisher (or just to please the reader), it does not matter what kind of book it is. I just read “A matter of class” this morning. And I was immediately in love with the plot, it’s just that kind of story I long to write: romantic, light, fun, with its touch of drama and many characters full of personality. You are my greatest inspiration, Mary, my diva! Longing is also one of the most poetic and charming books I have ever read. It’s like I’ve really been transported to that world. And Joana da Fonte from Beyond the Sunrise is one of the heroines I love the most in the world. She is simply wonderful, a masterpiece of you. I was reading about the Portuguese Revolution called Maria da Fonte and wondering if the history of this revolution had been the source of your inspiration for her. No, Isabella, I haven’t read anything of the Portuguese Revolution and have not heard of Maria da Fonte until now. There is always so much to learn but too little time! I really enjoyed this post. It’s so interesting to hear how writers create their books since I am definitely a reader, not a writer. I have been a fan for a long time and love your Simply, Slightly, and Survivors’ Club series. I would love an autographed copy of one of your books. I love your books, and now have my mother hooked as well! She tends to read very heavy non fiction, so I had to smile when I saw her unable to put down your books all summer long. It would be a delight to be able to surprise her with a signed copy of LONGING. Thank you for writing such enjoyable novels. I can’t wait to read more. I think I write just like that, without a clear idea of where I am going, but with characters who surprise me along the way as we go somewhere. I once heard another author explain that such a writing style was called a “pantser” as you’re writing by the seat of your pants (rather than outlining everything). My outline might be “they meet in London and fall in love,” and there’s 3 chapters or the whole book. On Wednesday my youngest daughter turns 17. Where did the years go? My curled-headed baby girl is now applying to college. The Welsh books were ones I guess I never got into. I’d love to win one, it would be a brand new book to me!